Some tree species heal from the ravages of hurricane damage by growing replacement leaves optimized for greater efficiency, according to a Clemson University field study presented at the British Ecological Society's annual conference. When Hurricane Maria hit Puerto Rico last year, ecologists at Clemson's Belle W. Baruch Institute of Coastal Ecology and Forest Science in Georgetown, South Carolina, took the opportunity to study how hurricanes affect tropical dry forests in the Caribbean. The worst natural disaster on record to affect the U.S. territory, the hurricane stripped numerous trees bare of their leaves and disrupted their ability to absorb the light needed for growth and survival. Clemson researchers sought to determine whether the trees were capable of compensating for the significant damage by increasing resource acquisition in newly produced leaves. At Tuesday's conference, which brought together 1,200 ecologists from more than 40 countries to discuss the latest research, doctoral student Tristan Allerton presented findings from the year-long field study. 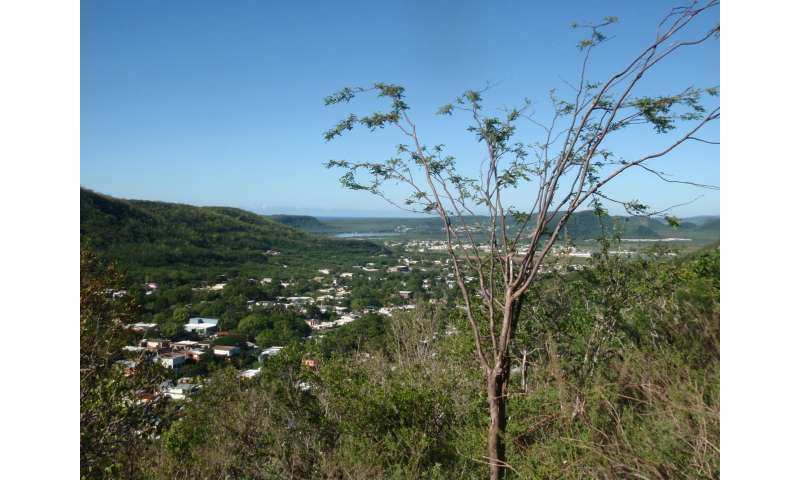 "Our study took us to the Guánica State Forest in southwest Puerto Rico, which comprises one of the best parcels of native dry forest in the Caribbean," said Allerton. "Rainfall here is extremely erratic, with huge variability within and between years. The forest also sits on limestone from an ancient coral reef, which is extremely porous, meaning trees have little time to capture water as it travels through the underlying rock. As a result, organisms are uniquely adapted to cope with unpredictable water availability." Trees rely on exchanging gas through their leaves, simultaneously collecting carbon dioxide from the atmosphere to convert into energy while trying to minimize water loss. To capture maximum leaf-gas exchange rates by trees, the team attached a sensor to new leaves in the forest at several points during the day. They also looked at the newly produced leaves' shapes and structures, which play an important role in efficiently extracting gas from the atmosphere. "A key finding was that the leaves of some of the species contained less chlorophyll than prior to the hurricane," said professor Skip Van Bloem, director of the Baruch Institute and Allerton's supervisor. "Even though new leaves were better suited structurally to capture valuable resources, lower leaf quality could reduce leaf lifespan and the trees' ability to produce energy." "Many of our evergreens displayed little change in gas exchange rates and in general the relative decline in new leaf chlorophyll after Maria was much greater than for deciduous species," he said. "Under normal conditions, evergreens renew their canopies over monthly and yearly timescales, therefore it's likely hurricane canopy damage is a more expensive process for these trees." "This would be a huge shame as Caribbean dry forests are known to have a higher proportion of endemic species than mainland dry forests," Allerton said. "Many trees found there are also incredibly ancient, making these forests a living museum of biodiversity." Just to clarify language - trees DO NOT HEAL. Healing is a form of re-generation. Trees cannot re-generate, they generate. As to the article's discussion, trees are well known to have the capacity to adjust their architecture, e.g. amount of leaf surface or leaf position, to adapt to environmental impacts. Defoliation certainly would qualify as an environmentally-related impact and it is not surprising that the trees in this study had the ability to compensate for defoliation by adapting their architecture.